Heading into the month of March in 2008, Newman/Haas/Lanigan team manager Brian Lisles was overwhelmed and exhausted. The elite Champ Car team had only days earlier made the commitment to join several other teams from that series in merging into the Indy Racing League and racing the full 2008 IndyCar Series schedule. The season-opener at Homestead-Miami Speedway was just weeks away and Lisles and his very overworked team were finding parts and pieces anywhere they could get them, then working nearly round the clock to build enough race cars to get Newman/Haas/Lanigan on track. When driver Graham Rahal crashed during a preseason test at Homestead Miami Speedway, the team had no backup car for him and the youngster was forced to miss the season-opener at the same track. But, showing resilience and perseverance, Newman/Haas/Lanigan got a car ready for Rahal in time for the second race, at St. Petersburg, Fla., which the then-19-year-old won, becoming the youngest driver to win a race in IRL history. Now, about to begin its third season in the IRL, the team is comfortably part of the league. But the challenges remain. Reach by telephone during a three-day preseason test at Barber Motorsports Park in Birmingham, Ala. this week, Lisles said Newman/Haas/Lanigan, trimmed from two cars to one and without Rahal due to lack of sponsorship, is ready to continue its IRL education and keep making inroads on the top teams. 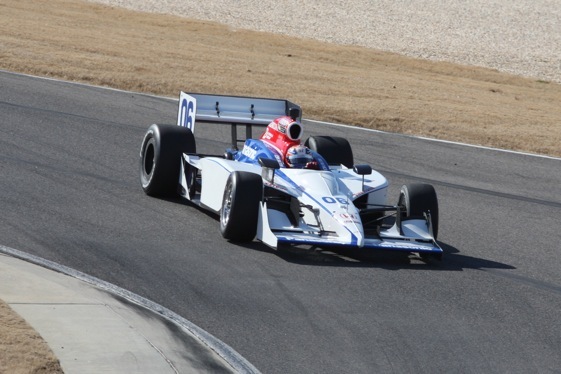 Hideki Mutoh, who spent the past two seasons driving for the four-car Andretti Green (now Andretti Autosports) team, has replaced 21-year-old Graham Rahal in the team’s only entry for 2010. Losing Rahal was tough on the team and the driver, considered one of the bright, young stars of the sport but still looking for another ride. The youngster, the son of longtime racing star Bobby Rahal, recently told Tim May of the Columbus Dispatch, “It happens to a lot of drivers in this league from time to time, so it’s part of the game. But for me personally, after the year I had last year – qualifying in the top five almost every race; we ran up front a lot; I finished sixth in the points, and if the driveshaft doesn’t break at Sonoma, we would have finished in the top five, no problem. It’s also unsettling for a team that has a built-in disadvantage over the longtime IRL outfits like Target Chip Ganassi Racing, which has won the last two championships with Scott Dixon and Dario Franchitti, Penske Racing and the Andretti team. “We’re going up against people who had these cars for a long time and been in a position to spend a lot of money understanding them, with drivers who weren’t experienced in what was needed,’’ Lisles explained. “Yes, it took away a lot of our knowledge. These last two years have been difficult for the team, owned by Chicago businessmen Carl Haas and Mike Lanigan, as well as the estate of the late Paul Newman, which has a long history of success in open-wheel racing. With two wins in the IRL – including one by Justin Wilson at Watkins Glen in 2008 – Newman/Haas/Lanigan Racing has totaled 107 victories. But it could be a while until the proud team gets back to winning on a regular basis. “Obviously, everybody wants to win and that’s our long-term objective,’’ Lisles said. “We know a lot more now than we did a year ago. And, obviously, last year, we felt we had learned a huge amount in our first year in the IRL. The best finish for the 27-year-old Mutoh in his brief IRL career is second at Iowa in 2008. But the driver from Tokyo, who now makes his home in downtown Chicago, has shown enough ability and potential to please Lisles. “We ran him at Sebring immediately after Thanksgiving last year, so this is actually our second experience with him,’’ Lisles noted. “It’s all going pretty smoothly. Usually, when you first run a driver you have things like seat issues. But all of those are behind us and we had a pretty productive day behind us yesterday. So far, everything’s going smoothly.